The film Ken Loach made before his masterpiece, Kes. A doleful film about a person who has never experienced true happiness. Moody, poetic and artful. 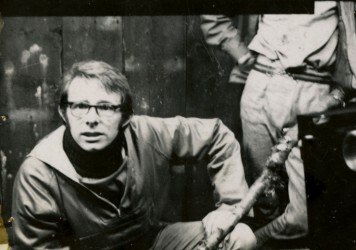 Another side of Ken Loach. Come December, it’s highly likely the broadsheet arts pages will be dubbing 2016 the year of Ken Loach, as Nuneaton’s favourite son has already netted a Palme d’Or for his latest feature, I, Daniel Blake, and been the subject of a career retro doc in cinemas, named Versus: The Life and Films of Ken Loach. The fun party continues with this restoration and re-release of his 1967 adaptation of Neil Dunn’s novel, ‘Poor Cow’, concerning the trials, tricks and tribulations of a working class mother attempting to eke out a living in an unforgivingly bleak London. Actor Carol White recalls a young Julie Christie as she plays the ironically named Joy, left to fend for herself and infant son, Jonny, when her wideboy hubby is sent down for a bungled heist. The film charts the many decisions she makes in search of some kind of small contentment in a world where all the chips seem to be stacked against her. Loach is extremely matter-of-fact in depicting the various degradations she suffers, always emphasising the idea that she never seems truly upset or depressed by her sorry lot. The tragedy of the film is that Joy has never truly experienced happiness, so stifled misery is her default setting. Her victories in life are extremely small ones. This is interesting for Loach because it’s an example of a time before he became an explicitly political filmmaker. The film is a character study more than a narrative drama, and the details of Joy’s existence become implicitly rather than explicitly political. Deep-set misogyny which runs through all levels of society is one of the key themes, as Joy is used and abused by men of all stripes throughout the film. Poor Cow’s most grotesque sequence is a sweaty, back-room nudie shoot, made all the more depressing because Joy appears cheerily immune to the leery, greasy gents manipulating her and cackling from behind their cameras. Where as Loach more recently has become a director driven entirely by narrative economy and reeling a good, socially-relevant yarn, the strongest elements here are those where the camera is allowed to drift off and soak up the details of a room. Every face that appears on screen tells a story. There’s an amazing amount of colour in Poor Cow, and its profoundly grim social-realist style causes the film to double as a melancholic documentary portrait of the craggy-faced have-nots and doled-up strumpets whose impossible dreams are pacified by booze, fags and egg sarnies.